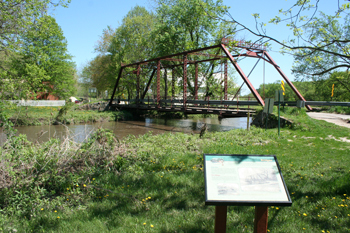 The Forestville Bridge is a steel, single-span, pin-connected Pratt through truss constructed in 1899 to carry wagon traffic over the South Branch of the Root River to the settlement of Forestville in Fillmore County. Forestville was abandoned in the 1870s when a railroad line was laid through other nearby communities. In the 1970s the Department of Natural Resources developed the Forestville/Mystery Cave State Park, which encompassed the Forestville town site and bridge. The bridge currently serves as a trail providing pedestrian access over the river into the state park. It is a contributing structure to the Forestville Historic District, which is significant as a frontier settlement whose founding is representative of the rush for land that followed the treaty of 1851. Design and construction of steel, pin-connected, Pratt through truss with stone abutments. and bridge plate in the bridge portal.